The Aerostats obtain a Sponsor. 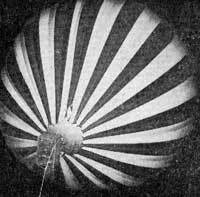 In January 1965, a fabric company in Japan offered the Society enough fabric to build a 60 ft diameter balloon. It was to be named Teijin (the company name). When completed, Teijin was 60ft in diameter, it stood 75ft high, and had a volume of 120,000 cf. It was of ripstop polyester fabric, with a heavy aluminium and acrylic coating on the inside to retain the heat. It took 4 people just to lift the envelope. On the 12th of Oct 1965 , Teijin had its first tethered test flight at St. Paul's Oval, University of Sydney. Several successful ascents were made, carrying up to six people. However, a drunken bystander heard somebody call out "Pull us down".He pulled a rope which opened two 84ft long zippers. These were for rapidly deflated the balloon, and virtually divided the envelope into two halves. 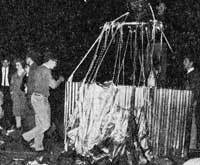 Although only 10 feet up, the balloon crashed heavily, landing on Terry McCormack, breaking his shoulder and trapping him underneath. A fire broke out, burning Terry Golding. This was a serious setback, and many repairs and modifications were needed.